Getting married is undoubtedly one of the most pleasant feelings in the world after all you are going to spend the rest of your life with the person you love. But what makes this pleasure even more thrilling, the answer of course is taking your dream honeymoon. Your honeymoon is likely going to be your first real chance to enjoy some best quality time with your life partner. Wedding planning with being exciting can also be a major source of stress and the planning for the most romantic vacation of all time i.e. “Your Honeymoon” should be the joyous part among all. It is not only one of the few times in your life but it will be totally acceptable to take more than a week off from work and a chance to be treated like a king and queen by the people who get to know that you are newlyweds. This trip should incorporate all of your favorite things as a couple into one place and that takes away from your time spent simply enjoying one another's company. So, where exactly should you go for this “never forgettable gateway of Romance”. Crystal-clear waters and white-sand beaches are placed on the top in the world’s top honeymoon destinations. And Seychelles Island is one of them, which is known as the “Ultimate Dream Honeymoon Destination”. Seychelles is not just a honeymoon destination but it is much more than that as it has plenty to offer for the people who are looking for a different travel experience. Seychelles is considered as the heaven on Earth. The beautiful country is blessed with white sandy beaches and deep blue waters having an exotic sea life. The island nation, Seychelles comprises of 115 islands (some are granite and others are coral islands) within itself is located off the coast of East Africa. Seychelles has been known to attract newlyweds and inviting travelers looking for a beach holiday away from the bothering crowds. The country is known for its unrealistic beauty and enormous luxury. Considered to be a place for riches, it is slowly becoming the best honeymoon destination, especially for Indian couples. Book your honeymoon tickets with MMT: https://bit.ly/2se39k9. 1. Praslin Island: The most perfect island is famous for Vallee de Mai and it is the world-famous home to the popular coconuts “Coco de Mer palms”. Moreover, it has shops and stores having an exquisite & invaluable black pearl. You can even go shopping artful delicate jewelry made of real black pearls. Praslin Island is a must visit place for the people who want to pamper and impress their partner, all at the same time. This island also comprises a fascinating National Park, known as Praslin National Park which adds beauty to its scenic charm. You must make sure you visit this place on your trip to Seychelles. 2. Mahe Island: This is the largest island in the Republic of Seychelles which encompasses the highest mountain ranges in itself. Victoria the world’s smallest capital is also on Mahe Island. Tourists should pack a picnic basket and set out to enjoy the best mesmerizing views of Mahe Island. Get an unmatched experience of colorful birds and refreshing vegetation on the trails. You may never know, but the privacy at such a beautiful place can lead to a fulfilling hike with your new soulmate. 3. La Digue Island: The Island is the home of stunning beaches like Petite Anse and Anse Anse Source D’Argent. In addition, beach horse-riding and quest trips from the island to tiny Felicite Island (having population of only 12 people) have their own attractions that will surely make you visit this place. You can find various types of flora and fauna in the Veuve Nature Reserve on this island and get the best of your honeymoon. 4. Curieuse Island: Curieuse Island should definitely be included in your Seychellois honeymoon tour. This island has a marine park, which is quite fun for couples on a honeymoon in Seychelles. The red colored soil makes the place a refreshing one for the travelers after seeing all the blue and white. There you will find some very different & unique things like “Coco de Mer”, “hawksbill “, “Aldabra tortoises”, “mangrove forests”, “green sea turtle breeding”, “takamaka trees” and the “Seychelles Black Parrot”. 1. The National Botanical Gardens: The National Botanical Gardens are located on Mahe Island and it is the most romantic place to visit in Seychelles. Clicking pictures with most beautiful flora and to roam around or explore the sprawling and very large gardens will be the most cherished memories of your Seychelles honeymoon. If you’re a nature lover, this place must be in the bucket list of yours to soak you in the blissful vibes of nature. 2. The Clock Tower: The Clock Tower monument is in Seychelles for 115 years and is a proud & famous statue that is still admired and praised by the visitors & locals. This statue was built in the memory of Queen Victoria and it is made of cast iron. It was made by Gillet & Johnson. The Clock Tower is one of the most popular Seychelles’ locations among tourist to click a selfie with the clock tower in the background. So when you are in Seychelles to explore this scenic land make sure you don’t miss this famous landmark, which has a great historical significance. 4. The Anse Georgette: The beauty of Anse Georgette is although breathtaking but it is not so acknowledged and celebrated as of yet. But this not so popular place can cater the couples with an absolute haven like experience after all newlyweds are not so keen to have a crowd around all the time. So this is surely an extraordinary place to make you spend some quiet and private time with your partner. This place doesn’t have many things to do as it is sa oothing spot you can just observe the beauty all around and can simply relax here among all the scenic views. Have a picnic on the privately bagged beach in the tropical heaven. Make yourselves relax after the excursion of traveling with the tropical couple massage while enjoying the melodic silence meanwhile. Hold the hand of your partner and enjoy walking on the Island Causeways while talking about your beautiful future together. Opt to go for some water sports there you will definitely enjoy the loud laughs and joyful cheer with your lover. Go for exploring the beaches under the shimmering sky and spend some out of the world beautiful time with your partner. Witness the lifestyle of the natives of Seychelles by going for shopping in the Victoria Market. You will definitely get a great shopping experience there, as the market has everything to offer e.g. apparels, footwear, eatables and dairy produce. On the Seychelles Islands, you can simply enjoy the stunning sunsets and start a refreshed day with mesmerizing sunrises. Enjoy the beauty of the ‘Garden of Eden’ at Praslin Island of Seychelles. Secrets of Victoria Island can be best explored with a rental bike and get immersed in the refreshing weather. The Most famous Resort of Seychelles known as “Four Seasons Resorts” is something about the best of luxurious experience among the soothing Seychelles vibes. At this 5-star resort, comfort meets style with some really stunning views around itself. The resort is all about having a lavish dreamy honeymoon with your love. In the resort, you will be catered with fully air-conditioned villa having a private swimming pool and patio. You can’t ask for more because it comprises two restaurants named as Kennel and SEZ which offer a number of mouth-watering delicacies from all over the world. 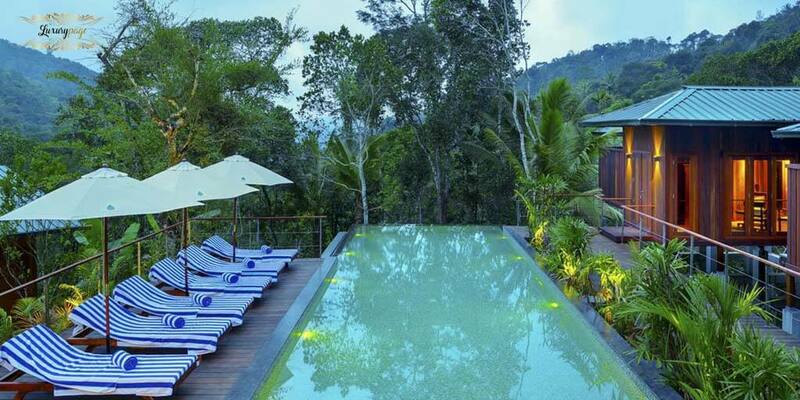 This resort is on Mahe Island and has a price range of INR 1,20,000 to 1,80,000 per night. You just can’t stop yourself trying this four-star resort “The Constance Ephelia Resort” as there you can get an experience of a lifetime. You will there be catered with a private garden area and a separate seating compliments. Many in-house restaurants are here to present you the most authentic Mahe Food. Moreover, you will g a wellness spa & gym along with the other activities like swimming, tennis, snorkeling. Everything here is made up to keep you fit, active and relaxed during your Seychelles honeymoon. This resort is situated in the Mahe Island and its price ranges between INR 30,000 to 50,000 per night. The Acajou Resort is on the Praslin Island and it has an array of accommodation choices, for example, you can choose to stay in the cabin styled log room or the rooms having beach views. This resort will surely give you and your love a very tranquil environment to enjoy. You can just relax in the infinity pool or enjoy a calm and relaxing massage. This place is also an in budget place as the prices vary from INR 17,250 to 30,000 per night depending on the accommodation you have chosen for. Victoria which is Seychelles’ Capital is the smallest capital in the world. You can roam around the entire city on foot in less than 24 hours. The native Coconuts known as the sea coconut or double coconut named as Coco de Mer produces the heaviest and largest seed in the world. You can find some of the rarest species of birds in Seychelles that includes Syer or the bare-legged Scops Owl. This kind of owl is so rare that it was once thought to be lost but it was rediscovered in 1959. The Morne Seychellois National Park on Mahé Island is a must visit the place during your Seychelles holidays. There you can find this particular kind of Owl “the bare-legged Scops Owl”. The heaviest living land tortoise in the wild known as Esmeralda can be found at Bird Island. This unique tortoise weighs about 670 pounds. A lot of celebrities choose the iconic country to enjoy stunning private islands for their honeymoon or vacation. Duchess of Cambridge “Prince William and Kate Middleton”, spent their honeymoon at the North Island of Seychelles, a place which was formerly chosen by “David and Victoria Beckham”. One of the Indian Celebrity Couple “Aishwarya Rai & Abhishek Bachchan” also chose the place as their honeymoon destination. A ferry can be taken to get around from one island to the other. When you are in Mahe or Praslin, renting a car is a good idea, there you have an option for buses and taxis also. While in La Digue, it is better to rent a bicycle since the island is small and you can discover all the beautiful sights while cycling. The black pearls locally cultivated are the center of attraction in Seychelles. Beautiful high-class jewelry and other exotic creations made from black pearls from Seychelles ‘Black Lip Oyster’ can be bought from Black Pearl experience three attractions in one: The Pearl Farm, Giant Clam Farm and the Black Pearl shop. Indian tourist looking for the Indian Food can visit to any of the 3 Indian restaurants in Seychelles, where they will be catered with all the authentic Indian specialties. In 1997 and 1998 “The Miss World Beauty Pageant” was held in Seychelles, in which the amazing islands were shown off by the media using the popular event. Thereafter, tourists started discovering this spellbound country. The Anne Marine National park in the Moyenne Island is considered having a haunting spirit and because of that no one ever dared to approach it. Seychelles at a time, was the land of pirates, particularly Anse Forbans on Mahe Island and Cote d’Or on Praslin. It is believed that the pirates were used the islands as a hideout and a treasure worth more than $160,000 was hidden at a time that has not been discovered yet. Above 25 International Airlines operate from Seychelles International Airport and there are non-stop flights to 14 cities from Seychelles but no Indian city is a part of the group yet. There is a stop at Abu Dhabi for tourists from India. Over 320 international flights depart from Seychelles and it could be said that it is very well connected to the world. An average round trip for a person costs somewhere around INR 90,000.